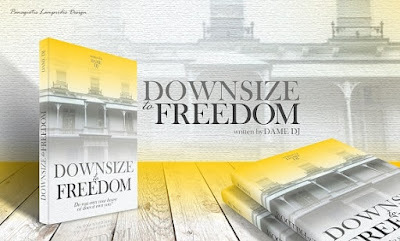 Today we are interviewing Dame DJ about "Downsize to Freedom." "Downsize to Freedom" is currently free! To get a copy on Amazon US, click here. If you're in the UK, get a copy from Amazon UK here. I married young, divorced young, had two children young, starved young, remarried a couple more times and went off and lived in a few different countries. I want to see a lot of the world, go places, live amongst societies, learn about cultures and I can only do that in relatively smaller homes because of costs and practicalities, so I keeping it small I can keep moving. This book points out how, where, what to use and find for a modern life style with a fresh personal philosophy. Removing debt is like cutting out a cancer, and the problem is it can take out a major organ.Its more than moving, shopping, and decorating. Who do you think would most appreciate "Downsize to Freedom"? Everyone who owns a home with a mortgage, its too big to cope with, is now single for whatever reason, needs to live in a city, etc. What inspired you to write a book about how to unburden and simplify everyday life by downsizing one’s house? I see one's personal 'freedom and liberation' in being liquid, unaccountable and with low maintenance costs. My major concern is a banking crisis, triggered by an event, then creating a domino effect. My lifestyle now is "I can lock up and leave," at short notice with relative, and with a comparative small loss. What do you think are some of the biggest misconceptions people have about downsizing homes? Did you have a single moment in which you realised you wanted to downsize? Or did you realise gradually that you needed to downsize? When we lived in a big house I noticed we only ever used 4 rooms. The kids /guests rarely came but eventually we needed to move. We all want to up-size ( I still do some days) but few realises what it takes to stay there. Its like credit card spending-easy to do but try to pay it off or pay the interest charges …very hard. Was downsizing as difficult as you imagined? Or was it easier or harder? What do you think are the most important things people need to consider when they are thinking of downsizing? Organising them selves on every detail, discipline, attitude and moral. With the right attitude every task can be lighter, quicker, fun and better performed. We sometimes can't practice the task we have ahead of us so we need others to point us in the right direction. I learn something every time I move and I love moving especially to new countries and have no problem with small homes. How do you think reading your book will impact people? I hope they enjoy the humour, learn a few tips and see a few things differently and gain mental freedom from that for living their own lives. To me variation of experience inline is important as I can't be in one place too long. Lets face it we are all running about trying our best against the odds, trying to find the best way to do anything we need to do. What do you have in mind for your next writing project? I just found all my notes and water colour paintings about a french road trip. It's not the usual tourist book but perhaps sees events, places humour, food, the countryside, history, sadness and joy objectively. Book are like conversations, films, theatre, recipes etc, a fleeting experience in our life on earth and hopefully a positive one. If you enjoy it pass it on. Why not, we are here to share in life.